Hawaii Native Status: Introduced. This naturalized shade, fuel, forage, fodder, and soil improvement plant is native to Mexico, Belize, and Guatemala. Description: The flower heads are round, white, 3/4 inch (1.9 cm) in diameter puffballs of numerous white stamens with hairy, pale yellow anthers. 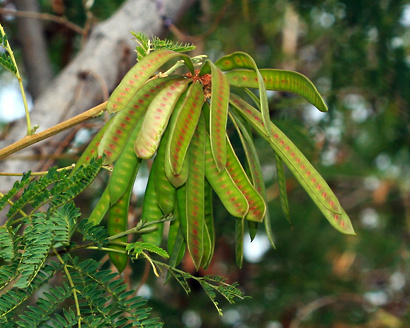 The flowers are followed by clusters of linear, up to 7 inch (18 cm) long, flat, thin, drooping, green drying to papery brown bean pods with a bead necklace-like row of seed bumps. The seeds are flat, oval, and a rich glossy brown color. The leaves are bipinnately compound with small, green, narrowly oblong, point-tipped leaflets. The branches have brown, corky pores and are thornless, hairy when young, and brown and hairless when old. Here in Hawaii, these common, drought tolerant plants grow in dry to well-drained mesic (moderately wet) disturbed areas at low elevations. These non-native plants produce huge quantities of seeds and are adaptable, extremely fast-growing, thicket-forming, and difficult to eradicate, making them a problem weed species. Although very weedy, White Leadtree does have a number of uses, which is why it was originally deliberately planted here. These fast-growing trees can be used for erosion control and as shade for coffee plantations. This legume can also be used as green manure because it helps fix nitrogen in soil and enriches it. The foliage can be used as animal fodder and forage for ruminants. The wood can be used for firewood or for making charcoal. The hard, brown seeds can be drilled and used to make attractive necklaces. Edible – The seeds and green seedpods are eaten in other countries, but they contain toxic mimosine and so should be cooked and prepared to remove most of the mimosine and only eaten occasionally in limited amounts. 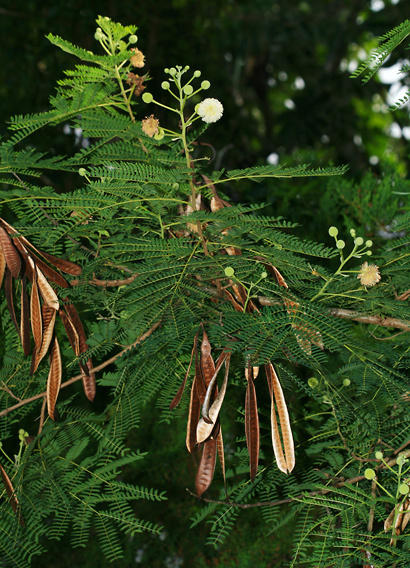 Poisonous – The foliage and seeds contain the toxic amino acid, mimosine, which can cause hair loss, reduced thyroid function, goiter, infertility, and other health problems if regularly ingested. 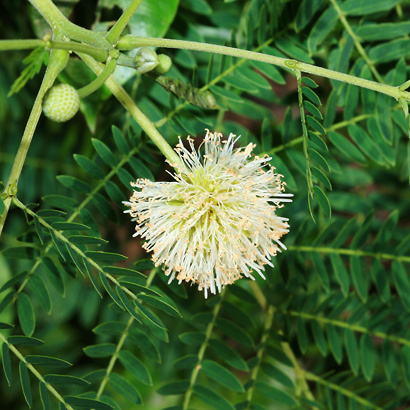 Some ruminants like sheep, cattle, and goats can safely eat this plant if they are accustomed to eating it and have the necessary rumen bacteria for it. Humans and non-ruminant animals can suffer hair loss and other health problems if they regularly consume this plant or make it a major portion of their diet.